Stern’s first book, The Social Life of Criticism: Gender, Critical Writing, and the Politics of Belonging, was published by University of Michigan Press in 2016. Tracing the work of aspiring female critics from the eighteenth century to the end of the Victorian period, Stern contends that a sustained engagement with gendered forms of sociability shaped the critical work of women writers (including Anna Jameson, George Eliot, Vernon Lee, and others). As the book explores representations of critical communities—from the Spectator Club and the “tavern sages” to the “antisocial” impulses of the 1890s—it argues that the history of criticism is inextricable from the history of gender. In 2015, Stern published an edition of Oscar Wilde’s controversial play Salome with Broadview Press. 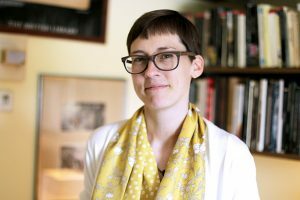 Her work on this play reflects her larger interest in the writings of the British aesthetes, which she examines in her current book project, Nature’s Test: Liberal Education and Aesthetic Discourse in the Nineteenth Century. Placing late nineteenth-century writers like Wilde in dialogue with important educational reformers of the nineteenth century (including Jeremy Bentham, Matthew Arnold, and John Henry Newman), Stern investigates how the late Victorians both anticipated and might enrich contemporary debates about the cultural value of humanistic study. As a corollary to this project, she is now completing a literary biography of Wilde, Oscar Wilde: A Literary Life, which focuses upon the key intellectual influences of his life. Both projects were originally inspired by Stern’s work in the classroom, where she has found her students to be enthusiastic and astute readers of Wilde’s work. Stern was the recipient of a Humanities Writ Large fellowship at Duke University in 2014 and is currently editing an annotated digital edition of Thomas Carlyle’s Sartor Resartus through the COVE Collective (http://covecollective.org). She also serves as co-editor of the interdisciplinary journal Nineteenth Century Studies. “At Wit’s End: The Aesthetic Pedagogy of Oscar Wilde.” Nineteenth Century Studies 28 (2018): 1-19. Oscar Wilde’s Salome. Ed. Kimberly J. Stern. Peterborough: Broadview Press, 2015. “A Want of Taste’: Carnivorous Desire in Charles Dickens’s The Pickwick Papers.” Victorian Review 38.1 (2013): 155-72. “The Poetics of Criticism: Philosophical Discourse and George Eliot’s ‘A College Breakfast Party.’ ” George Eliot and the Poetics of Disbelief. George Eliot-George Henry Lewes Studies 60-1 (September 2011): 91-106.